My wife won a contest last week through a local parenting magazine called Island Parent. As a prize my wife got to pick anything they had on their prize table. She and The Girl went down to the magazine office on Monday to claim their prize. After scanning the assorted books, toys, tickets and related stuff on the prize table for a few minutes, The Girl’s eyes stopped and became fixed on something. My wife looked at the book The Girl was checking out. It was titled Got Tape? 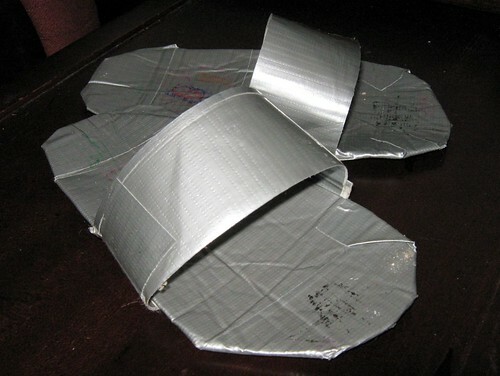 : Roll Out the Fun With Duct Tape! . How could she resist? Their first project? The pair of flip flops in the photo above. I sense a new suit is in the works for Father’s Day.